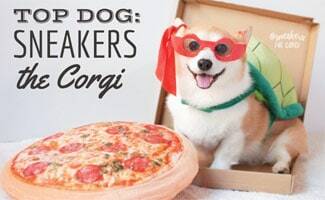 Home > Stories > Top Dogs > Why Is Sneakers the Corgi Obsessed With Pizza? Sneakers is an adorable, lovable Pembroke Welsh Corgi hailing from San Fransisco, California. “Sneaks”, loves to make people happy and even collaborates with local up and coming artists to design beautiful apparel, home goods and stationary for dog lovers. (We especially love the La Croixgi items which is a spin on the sparkling beverage La Croix). Sneakers has a love of dog costumes (as you can tell from his Instagram account @sneakersthecorgi) and all things pizza. 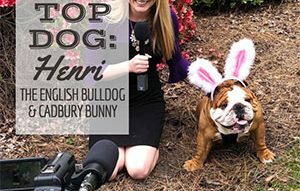 Get to know her better in our latest Top Dog interview. How’d you get the name Sneakers? Most people think it’s because I love to chew on shoes, but that couldn’t be further from the truth. Have you tasted a shoe lately? I’d much rather have a slice of pizza! My hoomins both love footwear, but also, I have little white paws and it always looks like I have socks on. But one of the hoomins objected to the name “Socks” because it sounded like a cat name, so we went with “Sneakers”! What’s life like in San Francisco? Sometimes I get recognized, especially if I wear my signature owl backpack, but often I’ll just hear “OMG CORGI!” as I walk down the street. 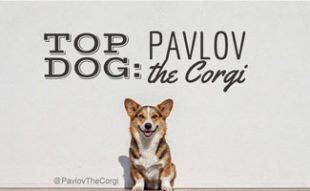 Something about corgis always makes people smile, though I really don’t know why since I’m such an intimidating canine. We love your adorable outfits! Where do you find them? 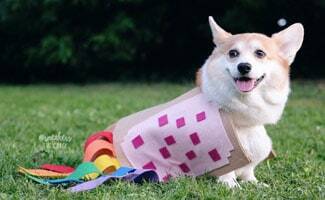 My hoomin makes some of them, like my NyanCorg outfit (inspired by the popular “NyanCat” YouTube meme, see photo on right) and my CorgBus costume (inspired by the Japanese film “My Neighbor Totoro”). But others are sourced from whatever the hoomin finds lying around the house, like old Halloween costumes, or are found online—you can find anything online. Since the day I found a slice of pizza on the sidewalk and tried to take it home with me, I’ve been in love with pizza. It has cheese and bread and pup-peroni—what’s not to love?! How did the idea for your store come about and where do you find such amazing designers? The hoomin works with talented, independent illustrators, artists, and designers that she connects with on social media platforms and online e-commerce websites like Instagram and Etsy. She works with them to come up with custom products based on my favorite outfits. The MerCorg designs and the corgi pillows are the most popular on sneakersthecorgi.com! 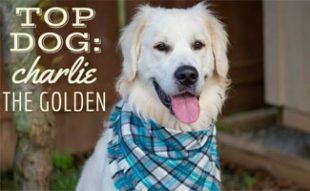 Who are some of your friends and favorite fellow celebrity pups? I love my corgi family and we always enjoy each other’s company at NorCal CorgiCon every year, a gathering of hundreds of corgis in San Francisco at the beach (see video below)! My favorite celebrity pup of all time is Marnie the Dog. What are your favorite collaborations and why? I love trying delicious treats, traveling and staying at dog-friendly places, and having the opportunity to meet corgi fans at fun events! Learning new tricks (as long as I get treats), napping with my hoomins, long walks in the city, and fetching the frisbee at the park! My favorite toy was one of the first toys my hoomins got for me: a very raggedy old hippo squeaky toy. But I love ALL squeaky toys! Thanks Sneakers for sharing your story with us! 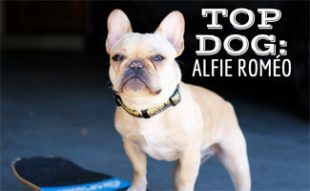 If you liked our interview, you might enjoy reading some other of our famous Celebrity Dog Q&A’s. What do you love most about Corgis?